My Lord Jesus Christ, true God and true man, my father and redeemer, behold at Thy feet a poor sinner who has so grievously afflicted Thy loving Heart. O lovable Jesus, how could i have offended thee and filled with bitterness that Heart that love me so and that has spared no effort to attain my love? How great has been my in gratitude! But, O my saviour, be consoled, be consoled, I say to thee; now i find myself repentant, such grief i feel for the afflictions i have caused thee, that i would like to die of poor sorrow and contrition. O my Jesus! who could have make me weep for sin as Thou hast wept for them in Thy mortal life! My soul is oppressed for having offended Thee. eternal father, in satisfaction for my offences I offer Thee the affliction and sorrow the Heart of Thy Divine Son has felt for them. And Thou, O Loving Jesus! give me such a horror for sin that from now on it may make me avoid even the most trifling of faults. Depart from my heart, earthly affections; I do not want to love anything now but my most bountiful Redeemer. O my Jesus, help me, strengthen me, and pardon me. My Mother of perpetual help, intercede for me and obtain for me the pardon of my sins. Among the innumerable titles under which Christian piety is pleased to invoke the Blessed virgin, there are few that are as likely to lift our hearts and fill them with unlimited confidence as the sweet name of Mother of perpetual Help, a name that pleases Her so. To convince you of this: consider, on one hand, what the life of man on earth is, and on the other hand, what the name of Our Lady of Perpetual Help means. Truthfully, what is life but a chain of miseries, dangers, afflictions and labours? in the temporal order, who is exempt from illness or from poverty? who is there who does not have to weep? in the spiritual order, who knows how, on every occasion, to be on guard against the great misfortune of sin, against the snares of lukewarmness, against the coaxing of temptations? Who does not weaken from time to time in the service of God, in the practice of virtue, and who does not tire at times in the path of good? Finally, what Christian does not tremble at the thought of the decisive and difficult moment of death, of the purifying fire of purgatory? In view of such miseries and necessities, the soul, overwhelmed, feels itself weakening and would like to burst into tears. But upon hearing the sweet name of Mother of Perpetual Help, it becomes serene, it takes courage, and continues joyfully on its path toward eternity. Why? Because it then feels that its lamentations are not lost in a desert, but that they find a gracious echo in the heart of a Mother Who desires, and is able, to help it. In truth, the Virgin of Perpetual Help means: a remedy for all the evils that afflict us - a remedy not just for a day, but perpetual, from the cradle to Heaven, help in everything and help at all times. Perpetual Help means: consolation in afflictions, in poverty, in illness, in labours; strength to give up sin, whether mortal or venial, and not to fall into it again. Perpetual Help means: fidelity in the service of the lord and of the virgin Herself, and therefore, final perseverance. Perpetual Help means: courage in the practice of virtue; special protection in the terrible hour of death; prompt and efficacious relief in the dreadful prison where just souls, who are still indebted to Divine justice, suffer before entering the heavenly homeland. Perpetual Help means: that even when circumstances or situations occur where everything seems hopeless, there is still one certain recourse: the Protection of the Blessed Virgin. Meditate and ask for what you wish to obtain from Our Lady of Perpetual Help. "Come hasten to assist me, O Mother sweet and kind!" Come hasten to assist me. O Mother sweet and kind! I humbly beg of Thee. To lead a sinless life. O Mother of Perpetual help, may your name never depart from my lips, nor forsake my heart. A visit to the image of Our Lady of Perpetual Help, reciting ten Hail Mary's and commending to Her all your necessities and those of your family. O Mother of Perpetual Help! For the ingratitude with which, until now, I have repaid Thy mercies and those of God, I deserve, as just punishment, Thy depriving me of Thy favours; but, O my sweet Mother, no matter how great my ingratitude is, Thy kindness is even greater. Do not disdain, therefore, to help a poor sinner who confides in Thee! Thy Heart overflows with charity for all and never has one heard it said that any unfortunate soul has left Thy feet without having his tears dried. Do not forget my miseries; intercede for me before the God of goodness, Who refuses Thee nothing and prove once more that Thou art worthy of the sweet name of Perpetual Help. During the last years of the 15th century, when the Turks were afflicting the Christians on the isle of Crete with bloody persecutions, a pious merchant was obliged to abandon his native soil forever and seek asylum under the skies of Italy. The vessel that conveyed him had scarcely reached the high seas, when it was lashed by a violent tempest, and in a few moments the hurricane tore off it sails and the raging waves destroyed it rudder. The crew, upon seeing their ship lost and made a plaything by the waves, terrified and struck with fear, awaited the death that would give the depths of the ocean for their tomb. In the mist of that frightful scene, only the merchant of Crete appeared to be serene. There was courage in his words and confidence glowed in his eyes. And as the fury increased, the pious traveller ran to the ship's interior, found his luggage, and uttering sighs of hope, returned to the deck carrying in his hand the image of Our Lady of Perpetual Help. "Look," he exclaimed, addressing the afflicted crew: "Behold the star of the sea; behold the beacon of navigators. Let us invoke Her in our afflictions. She will save us." Upon saying this words, the merchant lifted the precious image before the terrified crew members who grouped themselves on their knees around his feet. "Petitions rise from the earth and prodigies descend from heaven", according to saint Augustine. And sure enough: the travellers had hardly invoked Mary with that powerful cry of faith, when the hurricane stopped the course of its winds and the great ocean calmed its waves. The sun shore in the skies and the ship, rocked by the gentle breeze, went on to drop it anchors on the beautiful shores of Italy. This was the first wonder the miraculous image of Our lady of Perpetual Help manifested before the face of Christianity. She wanted to commence Her favours in a vanquished tempest, to teach us that, in all the torments of life, no matter how lost we feel ourselves to be, She will always be our life, our sweetness and our hope. May Our Lady Of Perpetual Help be loved, praised, invoked and eternally blessed! May she be my hope, my love, my Mother, My refuge and my life. Amen. My Queen and my Mother, before Your throne of mercy, I come for help and intercession. I beg for mercy and healing touch upon me and those that are sick, especially those that are terminally ill. Mother of mercy present all those that are sick before your Son; our lord Jesus Christ, who is the greatest physician; for miraculous cure and wholeness. Uproot every infirmity in our lives and grant us divine healing. Mother of perpetual help, intercede for me now and always, be my constant and sure aid in times of need, trouble or affliction. Help me to always serve, love and obey your Son; my lord Jesus Christ. lead me by the hand in this life that I live, that I may not stray from the path of life, but live according to the will of God, in order to have a blessed life here on Earth and to rejoice also in the afterlife. I commit to You today my life. I pray that You sustain and increase all sources of my joy and happiness and remove every form of discomfort and pain which is not of God in my life. Give me the grace to serve and please God that He may bless, favour and guard me in all that I do. I pray for the grace to always be your devotee and to always call on you in my daily life. I consecrate my family to you, asking you to always intercede on our behalf in every moment and at all time and I ask you to preserve our soul and lead us to your son; our Lord Jesus Christ. I give you my whole life and my entire being asking you to take strict possession of me from now hence forth as your property. I also consecrate today, all members of my family wherever they are, asking you to take over their entire lives. Oh mother of perpetual help, with a great confidence, i come before you today, in order to invoke your unfailing aid. You have seen the wounds which my lord and master has taken upon Himself to receive for my soul. You have seen the precious blood of your adorable son flowing for my salvation, you oh Mother know how much your Son; our lord Jesus Christ desire so much to save me. Behold, i cast myself at your feet, and ask you to obtain for me the grace I stand so much in need of. O mary my queen and mother, o most loving of all mothers, obtain from me from Jesus, the source of all good things, these grace here (mention your intention). My mother of perpetual help, you desire my salvation far more than i myself: our lord has given you to me for my mother; you yourself has chosen to be called mother of perpetual help. I trust not in my merit, but in your powerful intercession; i trust in your goodness and mercy; I trust in your powerful motherly love. Mother of perpetual help, for the love of your son Jesus, our Redeemer, for the love of my soul, grant me what I humbly ask of you. The miraculous image of the Mother of God, under the title of perpetual help, was venerated as early as the 15th century on the isle of crete. At that time, a pious merchant from that island found himself obliged, by the invasion of the Turks, to abandon his native land. Fearing that the sacred image would fall into the hands of the impious persecutors of the Catholic religion, he took it with him to preserve it from sacrilegious profanations. After a dangerous voyage, during which Our Lady of Perpetual Help preserved the ship that was carrying Her holy image from inevitable shipwreck, the devout merchant arrived in rome, where he died a few days later, in the home of a friend. Before dying he delivered that precious image to his friend, begging him to offer it for public veneration in one of the churches of rome. But his friend, held back by human considerations, did not fulfill the sacred charge and kept the holy image in his power. The blessed virgin appeared to him three times, ordering him to expose her image for veneration of the faithful in some church in Rome, and as many times that imprudent man refused Her. After a new apparition of Our Lady, accompanied by tremendous threats, that unfaithful trustee feel sick and died. The widow of this unhappy man persisted in keeping the precious picture in her home. Several admonitions where necessary to convince her to fulfill the divine will. Our Lady appeared twice to a little daughter, just a few years old, of that lady, and commanded her to tell her mother that the virgin of perpetual help wanted her image to be publicly honoured in a church situated on the esquline hill. The church indicated by the virgin was that of st matthew, which was in the care of the Augustinian fathers. This time the order of the Mother of God was carried out. 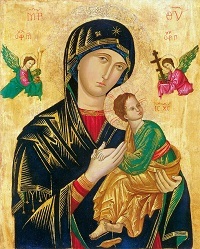 The image of our Lady of Perpetual Help was venerated in st matthews church for the period of 300 years. Maryourhelp - Copyright © Mary Our Help . All rights reserved.